The trip filled quickly and I was excited to have clients of mine from the Great Bear Rainforest joining me, Jenny Poppitt(Kelowna), Steve Moir(Squamish), crowd favourite Jamie McVicar(Canmore), Blaine Malberg, and photo queen Dorothy Jordan(Merritt). We were also joined by Lisa Bahan(Calgary), yoga guru Ann O’Brien( San Franscisco), US east coasters Lisa Rutkoske and Anne MacDonald, Cheryl Johnson(Astoria) and writer “Big” Steve Threndyle. Our Belizean guides were Kimike and Cappi and Tim was also there to provide support for our trip. IE photographer and filmer Duarte Dellarole also joined us. Day1: All of the guests arrived in Belize City where we were shuttled to the Tropical Education Center for the evening. After dinner we went on a nocturnal tour of the Belize Zoo which proved to be an exciting activity as we had the opportunity to see many of the animals and birds found in Belize including Tapirs, Ocelots, Puma’s, Howler Monkey’s and Jaguars, the largest and most powerful cat in the western hemisphere. 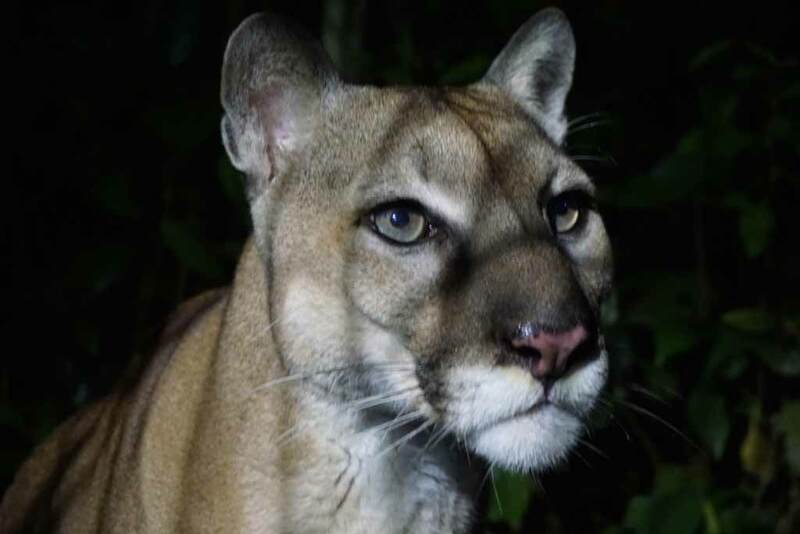 The Belize Zoo is one of the finest zoo’s in the Americas south of the United States. It opened in 1983 after a film “Path of the Rain God” left production assistant Sharon Matola with a collection of semi tame animals. 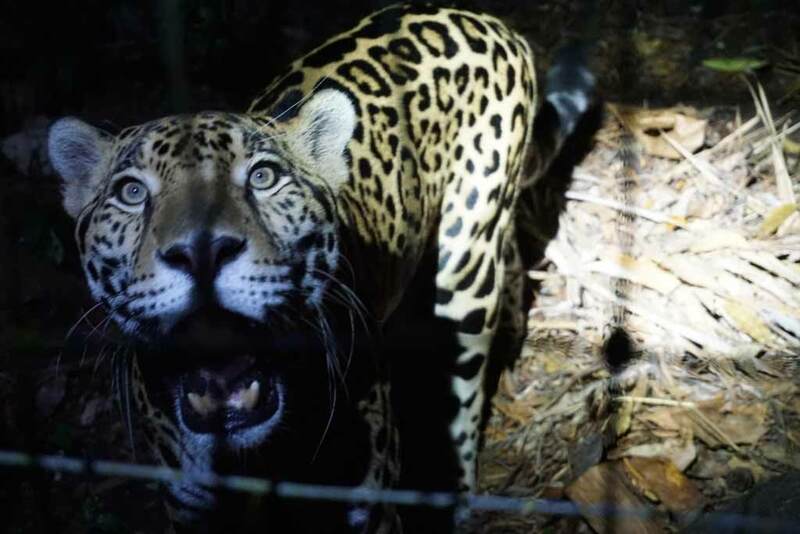 These animals which have been donated, confiscated, injured or have become problem for ranchers are surrounded by their natural habitat, the tropical rainforest. The zoo has a captive breeding program and is free for attending school children. Each of us donated $10 which goes back to supporting the zoo. It’s a real success story and our group had a fun time with the interpretation and the uniqueness of species. Day 2: After breakfast we left for the coastal town of Dangriga, a two hour ride from the TEC where Captain Ballz and his boat would be waiting to take us to our first island, Tobacco Caye. Belize is an english speaking country and Dangriga is the largest town in Southern Belize. It is the cultural center of the Garifuna- people of a mixed indigenous Caribbean and African descent. Dangriga located on the banks of the Stann River means “sweet or standing waters”. 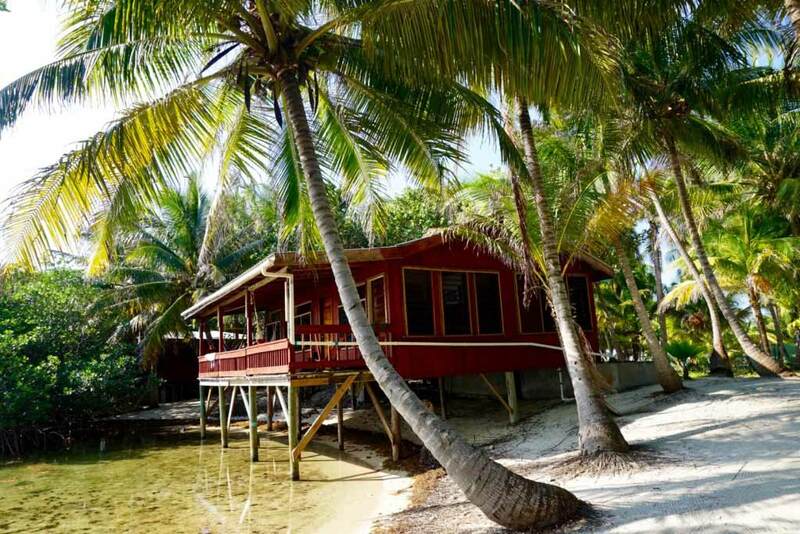 We had beautiful, hot weather for our 30 minute ride to Paradise Lodge on Tobacco Caye. After settling into our cabanas built on stilts over the water we took advantage of having the boat with us and we towed our boards up the reef for a couple of miles with hopes of down winding back. The wind ended up pushing us off the reef somewhat and most spent a great deal of time trying to figure out the “sweep” turn. Wind challenges aside everyone did well and I think we were all pretty happy to be on the water in board shorts under a blazing sun and a warm breeze. 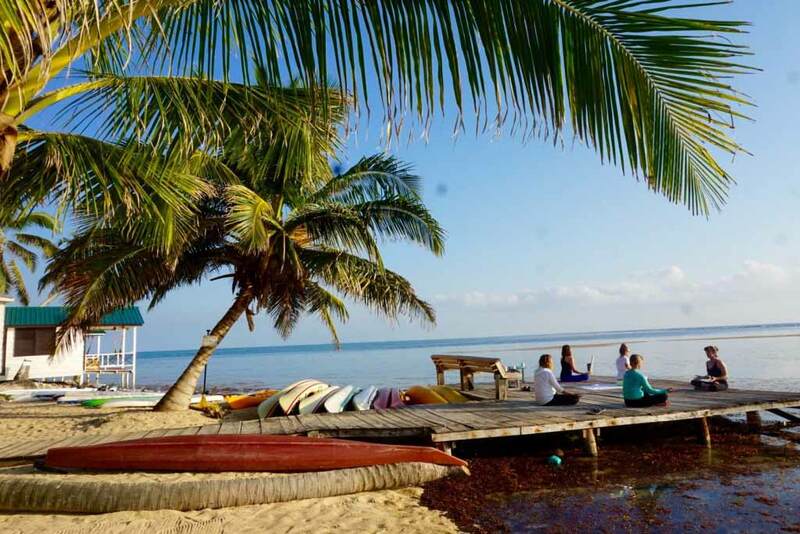 Tobacco Caye has already become one of my favorite spots in Belize. It’s a 5 acre island located on the reef crest and used to be a trading post where passing boats could get supplies including Tobacco. That evening we all fell asleep under a star filled sky with gentle waves lapping underneath our cabanas. Day 3: The day started with an early morning yoga session led by Anne followed by coffee and breakfast. Afterwards a natural history presentation by Kimike and Cappi on reef fish and coral was followed by a “walk off” (the island) snorkel. 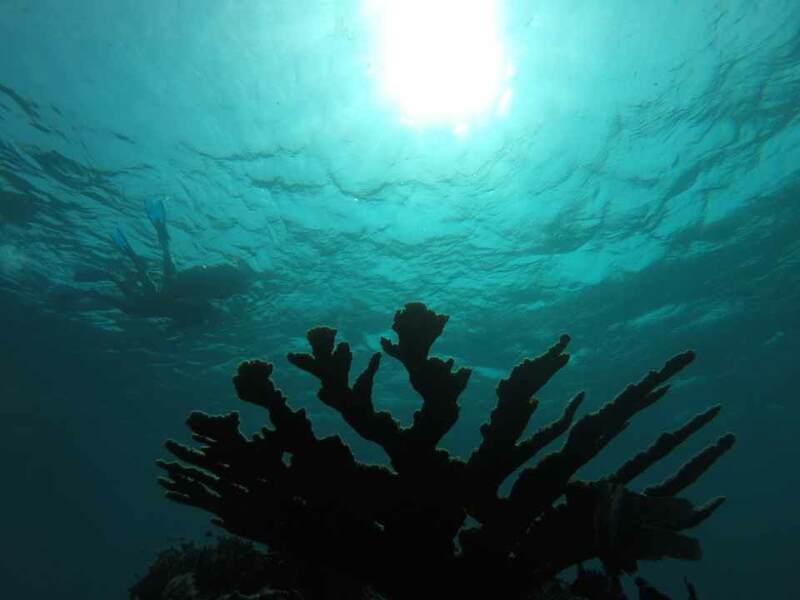 Belize has the largest living barrier reef system in the world called the Meso American reef. This reef contains a stunning, rich and diverse tropical marine ecosystem and the first look into the water leaves most people speechless. 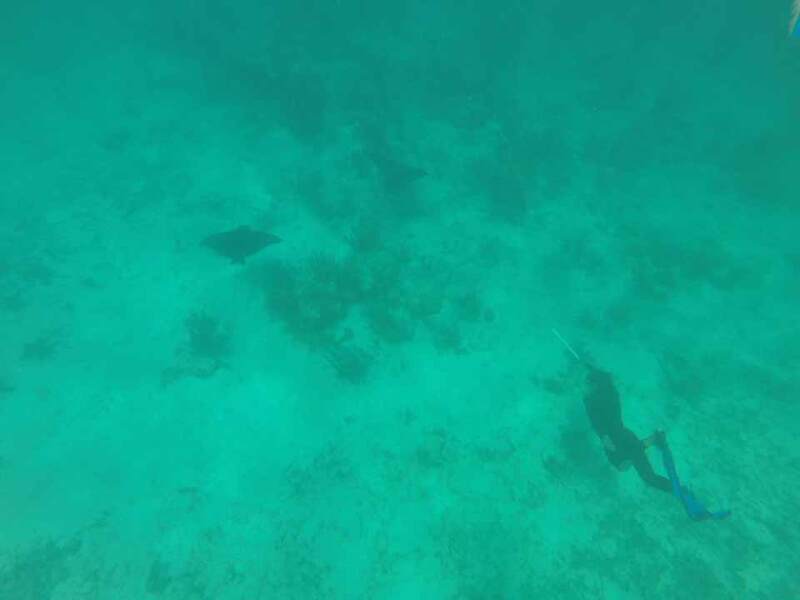 We had the opportunity to view all different kinds of species of fish and coral with Hawksbill turtles, Spotted Eagle rays and nurse sharks rounding the list. We were also warned about the Lion Fish, a beautiful but highly poisonous, invasive species that are known to make grown men cry if stung and were killed on the spot by lobster and conch fisherman. After the challenges experienced the day before in the wind, I offered a skills clinic to build an efficient forward stroke and to learn how to handle their boards properly in conditions beyond flat. Good technique and a solid understanding of flatwater skills i highly beneficial to paddling success throughout the week. 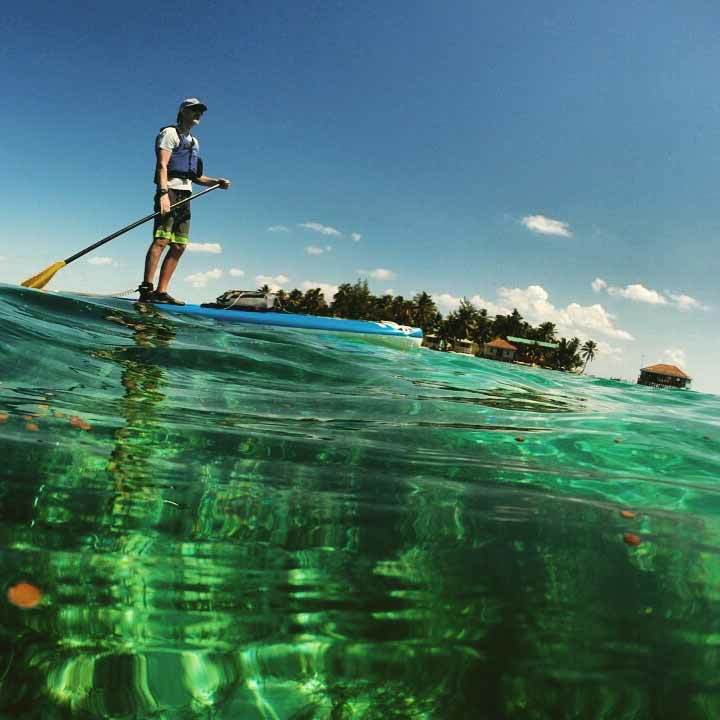 We used these skills for our light downwind afternoon paddle over to the Tobacco Range, a group of mangrove cayes an hours paddle away from Tobacoo Caye. The inside of this range provided flat calm conditions and it was another new habitat for us to paddle through. Located nearby, the Man O War Caye is a bird sanctuary name after the frigate bird which can always be seen flying over head. We were on the look out for manatees which prefer this type of a calm marine environment but we never saw any. 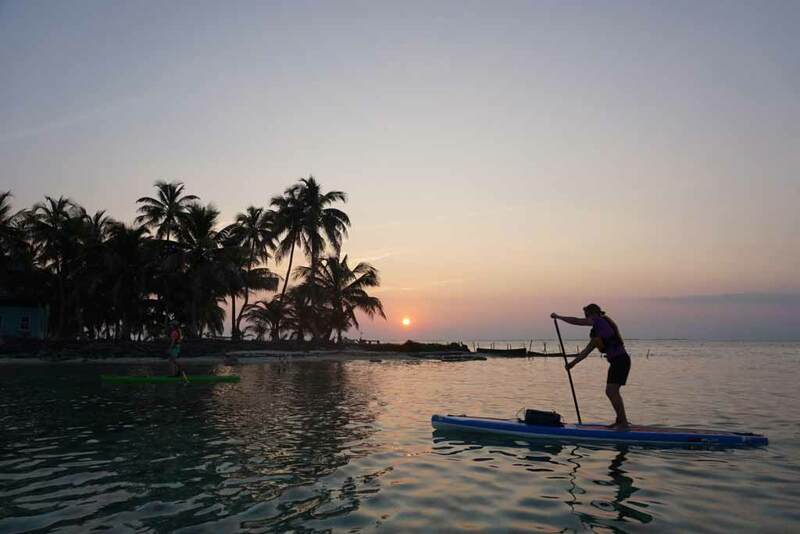 Those of us who had some energy left to burn paddled home while the rest of the group enjoyed a scenic boat ride back to Tobacco Caye, with boards in tow under an amazing setting sun. 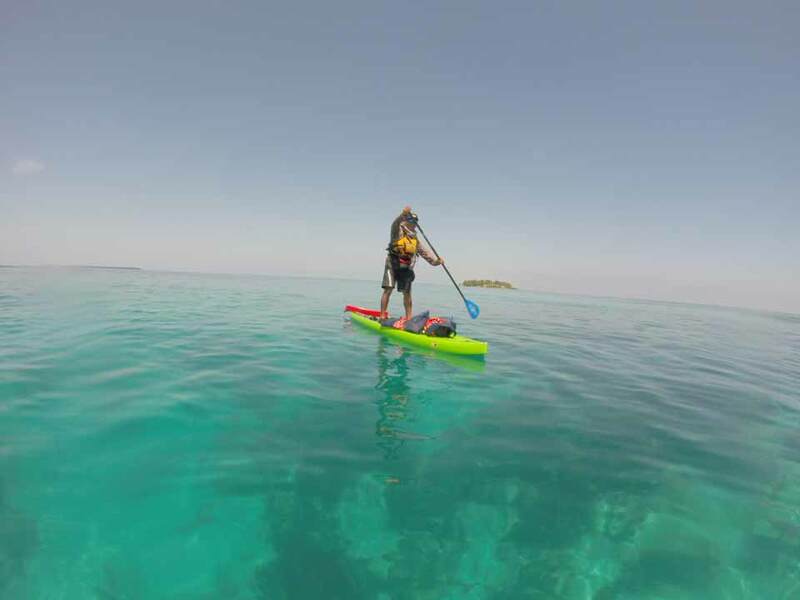 Day 4: This was our big day of paddling, a 5 mile trip from Tobacco Caye to South Water Caye located in the South Water Marine Reserve, a UNESCO World Heritage Site. Before leaving we did another skills clinic and then headed out. Right away we made a short crossing of the pass or break in the reef, the outgoing tide pushed against the incoming swell and we all found ourselves rising up and down on the glassy, deep blue waves. 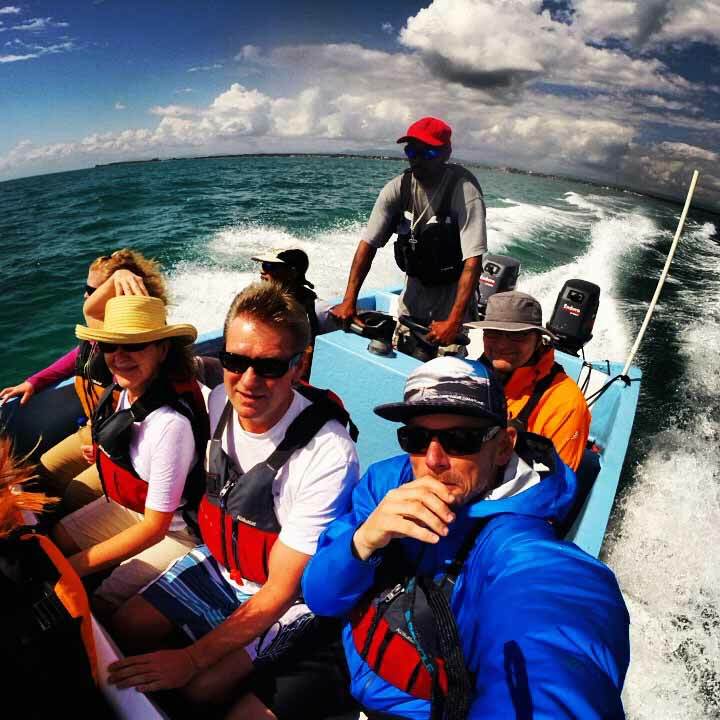 Kimike and Cappi were on sups while Tim and filmer Duarte were supporting from behind in a kayak. Even though the difference between high and low tide was less than a foot there was a significant current that made us work to get across to the other side of the pass, a short distance from Tobacco Caye. I think most of us had smiles on our faces while I was secretly looking for breaking waves that I could surf. Once we got to the other side of the pass Kimike lead us on another snorkel and aside from the usual suspects we followed a school of Barracuda along the reef’s edge. I was also told later that in deeper water nearby there was a school of tarpon, a highly prized sport fish that can grow to huge lengths. The strong outgoing tide prevented our group from trying to locate them. 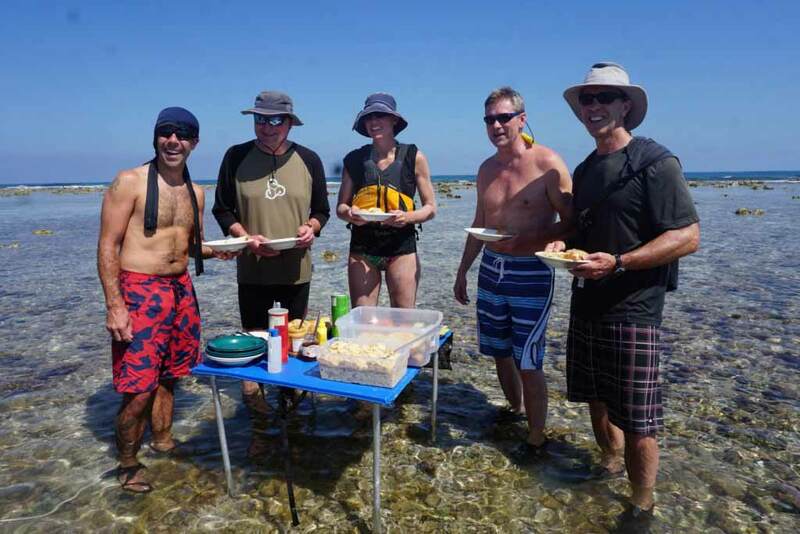 From the snorkel we paddled to our lunch spot where the guides set up a table right on the reef crest. We had picked the perfect day to paddle, it was by far the hottest day of the trip and the winds were light. This white Canadian was starting to feel the heat and it became critical to stay hydrated, covered and drenched in sun block. A good pair of polarized sunglasses were essential. 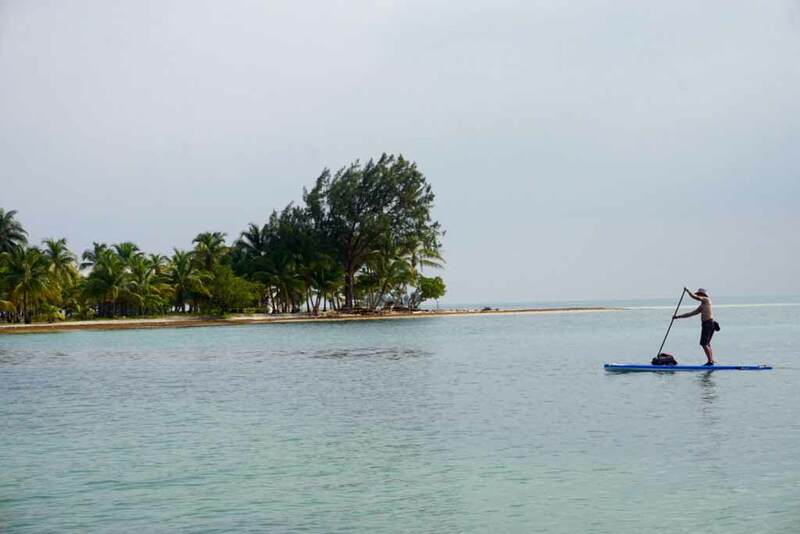 A solid two and a half hour paddle after lunch brought us to South Water Caye. It was a long afternoon and I was proud of the group as for most it was the longest they had ever paddled. For me after all of the paddling I have done, it was one of the most memorable paddles to date. I really enjoyed paddling in 3-4 feet of water with greens of all colors underneath for 5 miles. 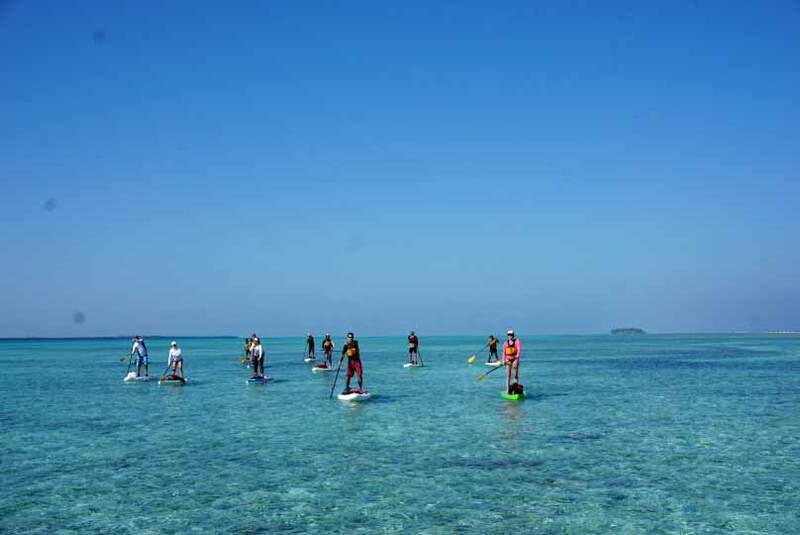 The paddle boards including hard boards and inflatables provided an amazing platform to view all of the species along the reef. I had my Boardworks Surf 12’6″ Raven Inflatable and it was perfect for this trip. 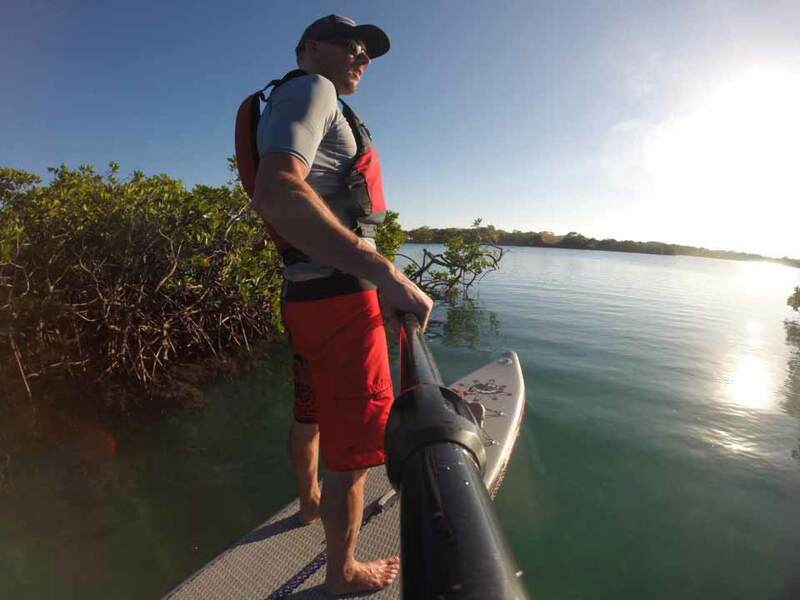 On this particular paddle we saw numerous nurse sharks, southern stingrays and bonefish. We had accomplished our goal of paddling from lodge to lodge and although a little tired the group was glowing with pride and accomplishment. We celebrated this accomplishment with a gorgeous sunset and a few ice cold Belikins. The whole trip from Tobacco Caye to Southwater Caye took us five and a half hours including snorkel and lunch. 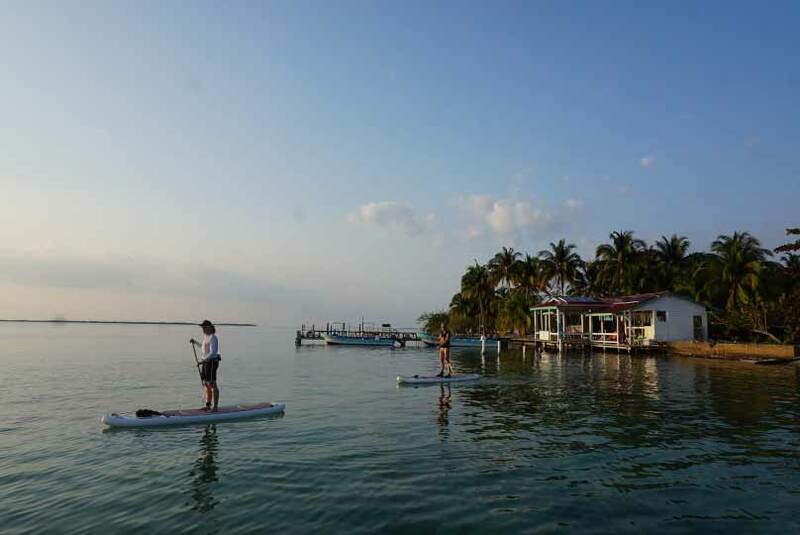 Day 5: Southwater Caye is another stunning island and Outside Magazine had recently rated it as having one of the top beaches. 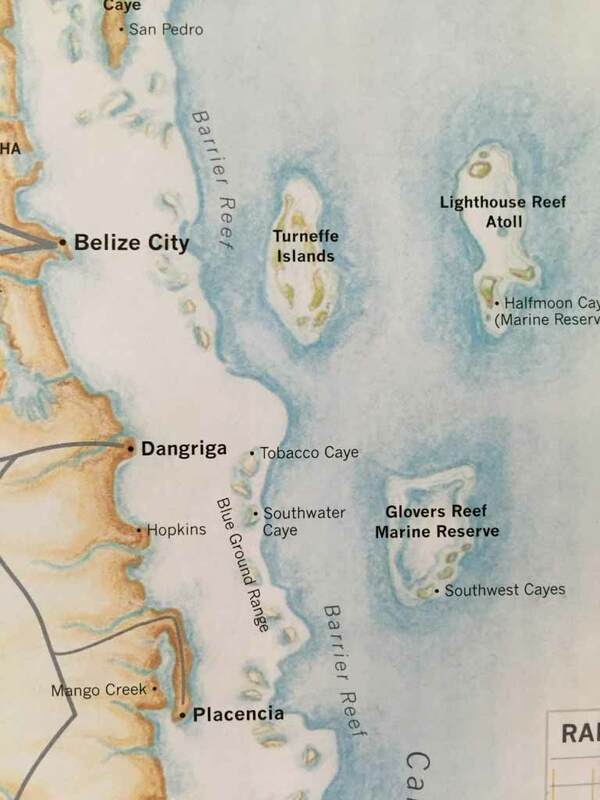 It is three times the size of Tobacco Caye and has a well at it’s center which provided freshwater for passing ships. This island, like Tobacco sits right on the reef and is at the center of the SouthWater Marine Reserve. Sea turtles nest on this island. 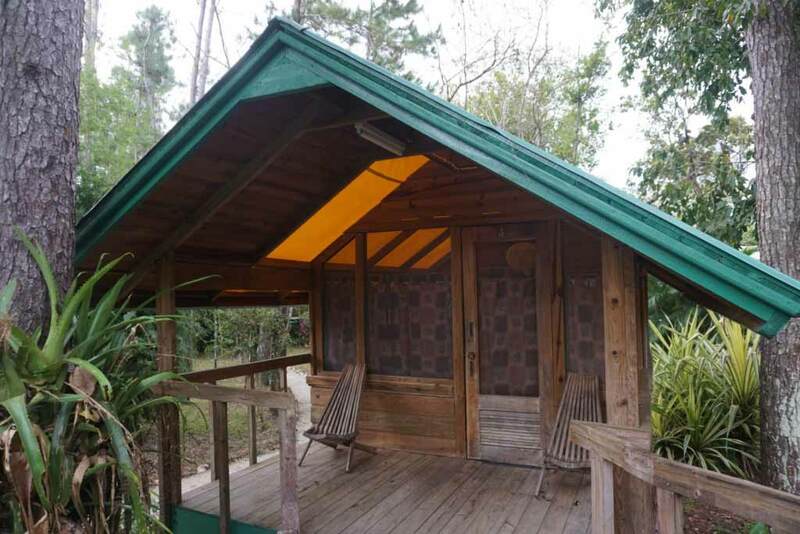 Our accommodations were at IZE, the International Zoological Expeditions Lodge that provided excellent rooming and superb food that sampled locally harvested species like conch, snapper and shrimp. Weather reported of an approaching cold front that had been wreaking havoc in the Eastern US and we awoke to slightly lower temperatures and strong NW winds. We had a relaxing morning and after lunch Tim provided the group with an entertaining weather talk. The winds began to die and we took the opportunity for another outer reef snorkel with Kimike and Cappi. I really enjoyed the snorkelling and took the chance to practice my free diving. The locals like Kimike and Cappi make it look so easy and effortless but that comes from a lifetime of freediving and spearfishing. 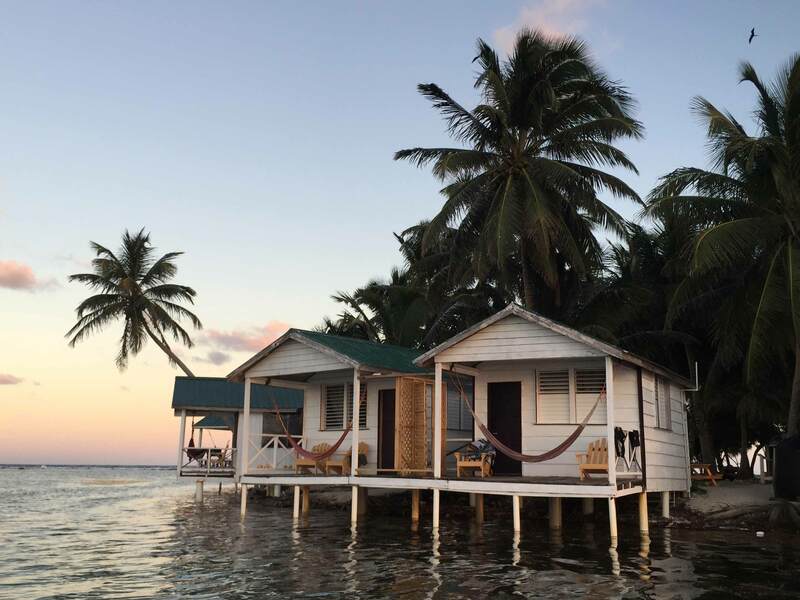 Many coastal Belizeans live off the ocean and provide income for their families by diving for conch and lobster while fishing for snapper, barracuda and other game fish. There is also world class bonefishing down here and next year I think I will bring my fly rod to see what I can catch. With the winds completely backed off we all paddled out to Carrie Bow Caye for the incredible evening sunset. 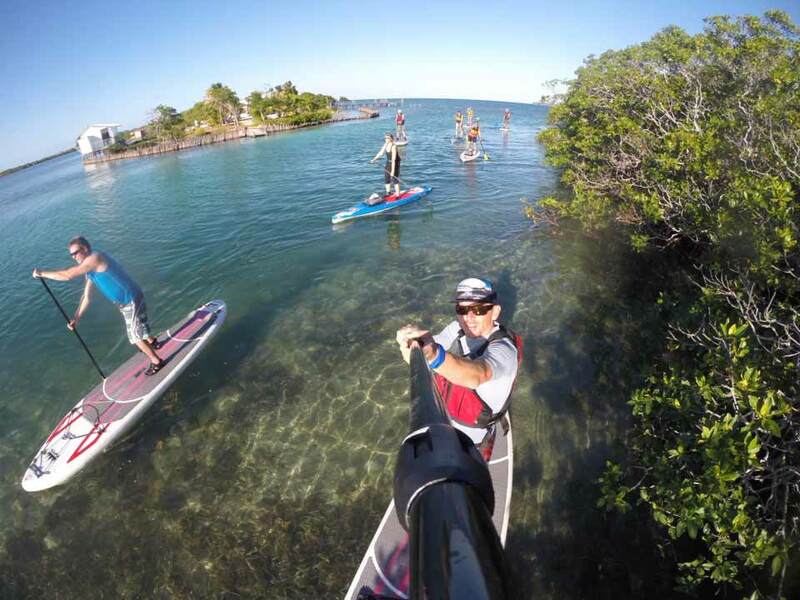 There was no doubt everyone was becoming more comfortable on their boards, the daily sup clinics were paying off. No sooner had we made it back to shore and Kimike and Cappi were organizing a night snorkel. This was an amazing and memorable activity as night descended upon us and we made our way to the sandy beach at the south end of the island. With diving lights in hand we slid into the waters and began to explore. Unlike the daytime dives, we were all in PFD’s and in very shallow water which allowed us to float without kicking up sand and silt. 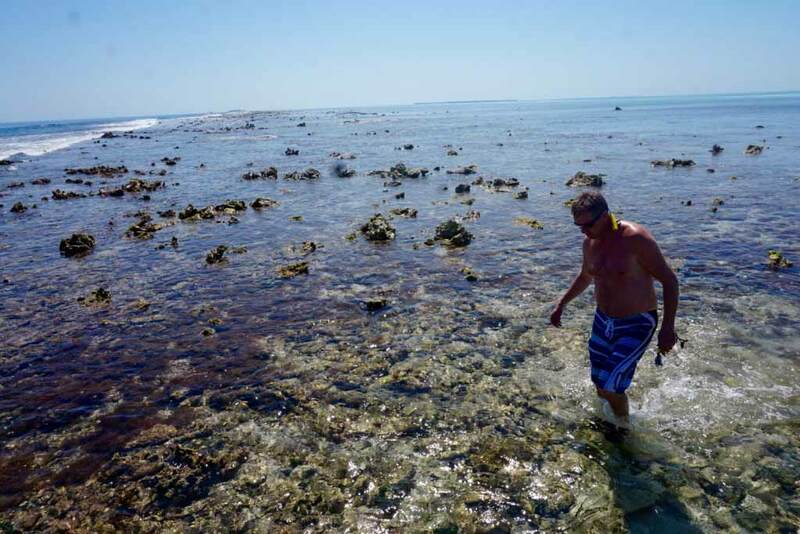 The guides are always sensitive about protecting the integrity of the reef system. It was absolutely incredible how many unique species we saw in such a small area. Moray and Spotted Eels, Octopus, Shrimp, Stingrays, Lobster, Lion fish, Puffer fish and more were all seen within 30 minutes. It was really amazing and both guides were spot on with their knowledge of all the marine species and natural habitat. Even though we had a late start with the wind we had a full day of activity. Day 6: The cold front brought very strong winds to the islands, so for most of the day it kept everyone pretty close to the island. Cappi enlightened the group with a morning talk on the importance of mangroves. These tree systems are critical to the natural habitat as they provide protection, wind blocks and stabalization to the cayes and prevent the islands from washing away in storm surges and hurricanes. The roots of these trees also provides water filtration and provide critical habitat for a number of tropical marine species. I did have the opportunity in the afternoon to take a group out the south side lee of the island where we had a lot of fun working on our our pivot turns, upwind and downwind paddling and the group even managed to catch some of their first ankle to knee high waves that were spilling over the reef in the strong winds. 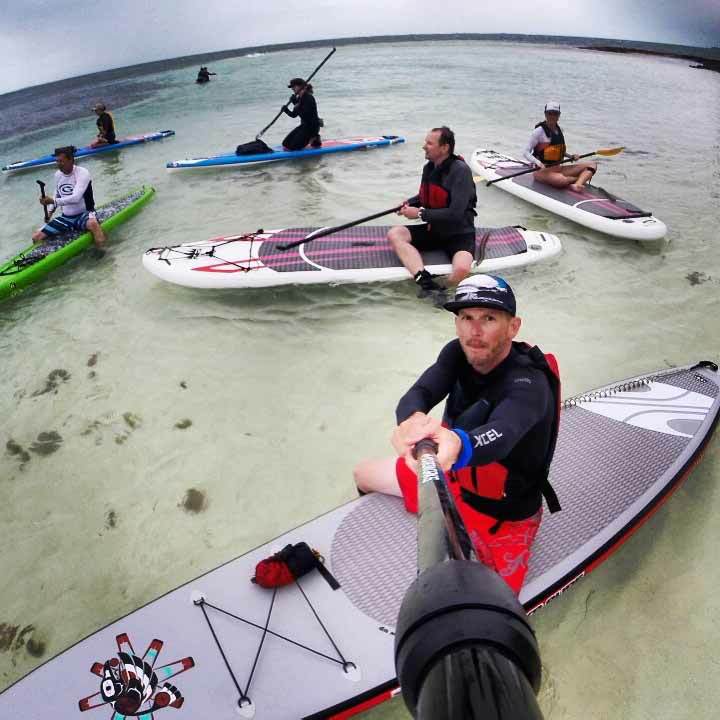 It was great to see clients increasing their comfort level from flatwater to more challenging conditions. With right instruction and focus on safety there are always fun conditions to be had on windy days. After a few more waves we headed back to shore for happy hour. Kimike was there to greet us and then proceeded to do a very entertaining talk on coconut trees. I did not know they originated in India. Kimike showed us the difference between Dwarf coconuts, good for drinking with high electrolytes and King coconuts which with their high oil content are good for baking, cooking and eating. 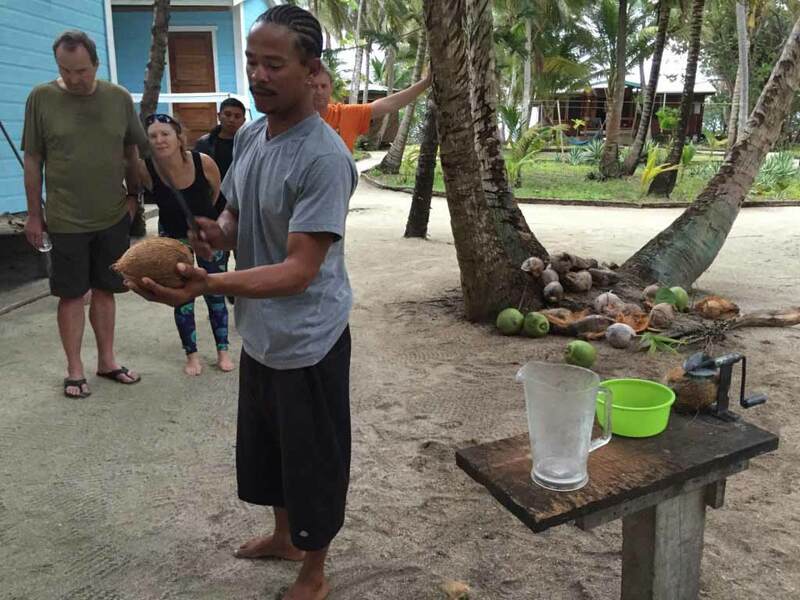 He showed us how to climb the tree, open the coconut and then served it with smooth, dark, 1 Barrel rum. This was the last evening together on the trip. We shared our favourite experiences from the week while enjoying another delicious meal prepared by Kimike’s aunties. Day 7: We were up for an early morning breakfast at 7 and then the Flasher Wrasse was there to shuttle us back to Dangriga. 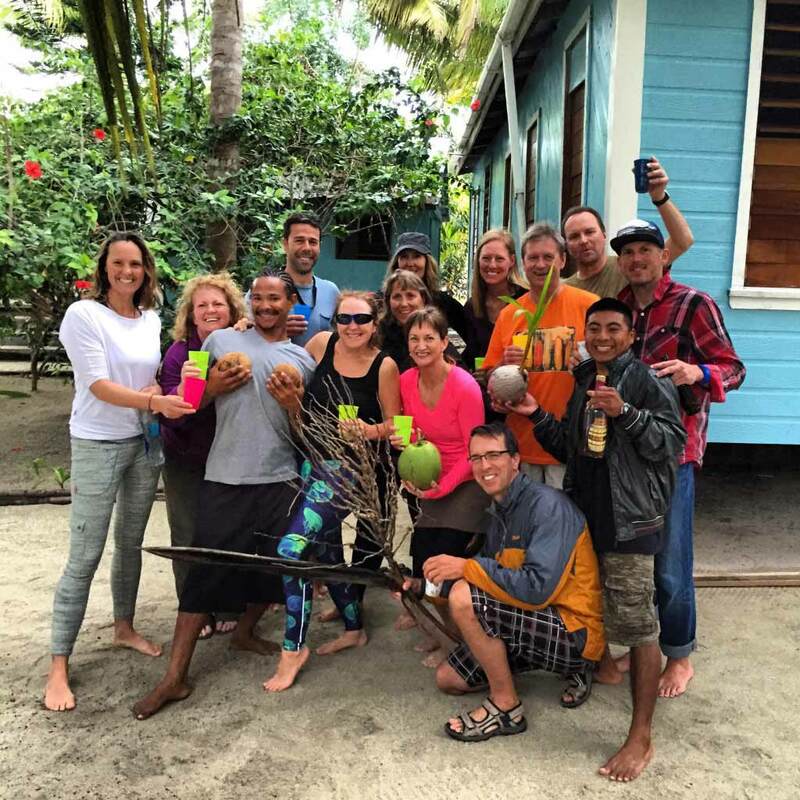 From there some flew back home while others added on and travelled to Island Expeditions newest venture, Bocawina, a jungle adventure lodge located deep in the rainforest. It has the longest zip line in Belize, maybe Central America with opportunities for hiking and waterfall rappelling. I had the chance to do the zip line, all eight of them and it was pretty amazing, the longest at 2300 feet was fast, ripping through the dense, jungle canopy. Aside from a short worker strike at the Belize airport that delayed me for another day, I made it back to B.C. a little darker than when I left. Overall it was an incredible trip, everyone left happy, safe and better paddlers. 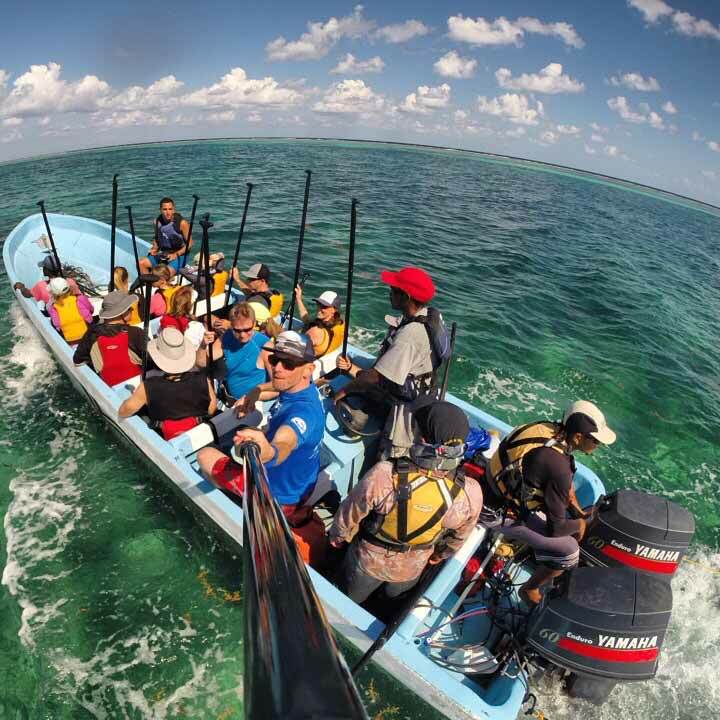 We had a lot of laughs and it was an amazing group to have for the first of it’s kind, lodge to lodge sup along the pristine Belizean reef system. Thanks to all the clients, now friends who came on the trip with us. A special thanks goes to our guides Kimike and Cappi and to owners Tim, Denver and Leif for having a great vision and providing a first class business to partner Norm Hann Expeditions with. Thanks also goes out to all of the support staff in Dangriga, the boat captains and all of the managers, cooks and support staff at the lodges. If your interested in coming to Belize next year with me stay posted for the dates and send us an email to express your interest. 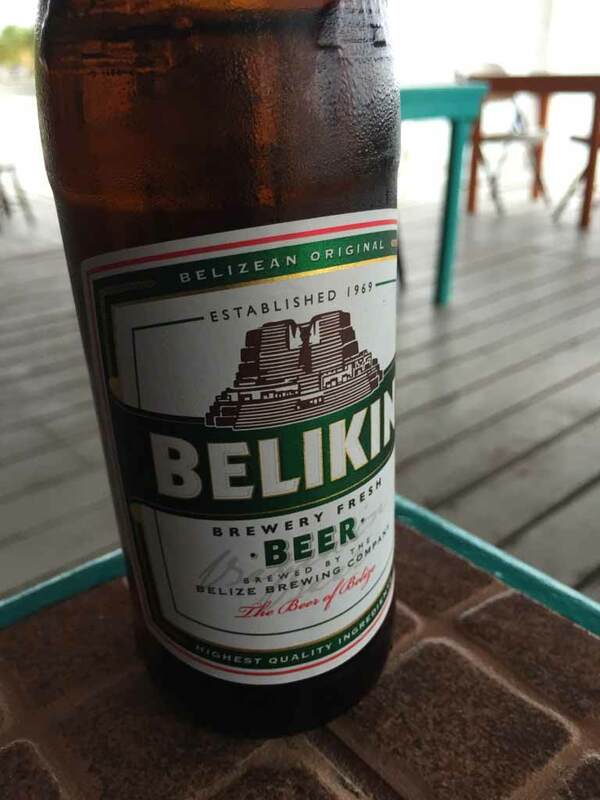 There is still so much to explore and new experiences to be had in Belize. 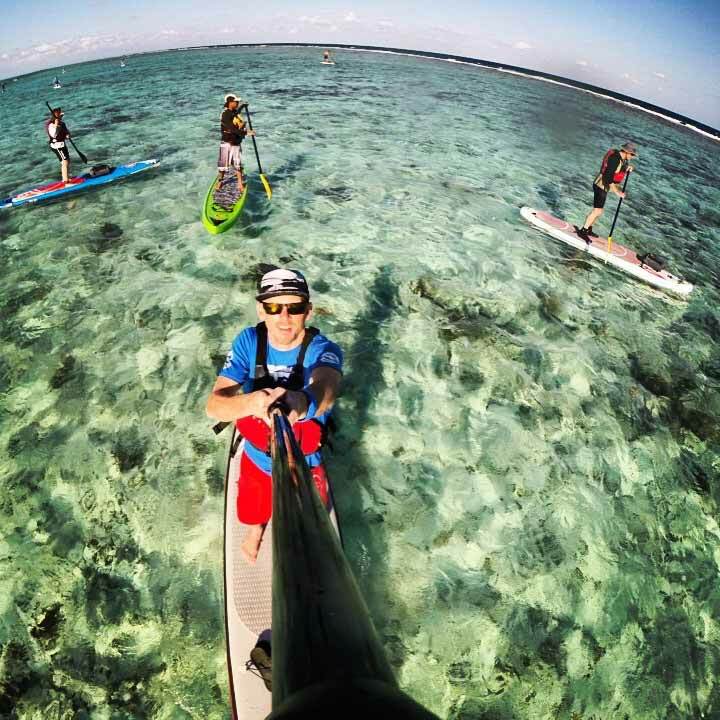 There are a number of adventure add ons to either the beginning or the end of your sup trip including the exploration of the numerous Mayan ruins, caving through the karst topography and jungle hikes. All can be booked through Island Expeditions. If anyone out there is interested in their numerous kayaking trip please contact them for details and itineraries or visit their website. We look forward to 2015/2016.